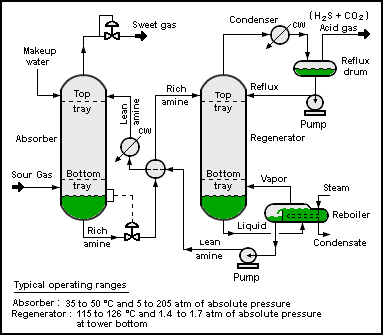 A process flow diagram (PFD) is a diagram commonly used in chemical and process engineering to indicate the general flow of plant processes and equipment. The PFD displays the relationship between major equipment of a plant facility and does not show minor details such as piping details and designations. Another commonly-used term for a PFD is a flowsheet. Process flow diagrams of multiple process units within a large industrial plant will usually contain less detail and may be called block flow diagrams or schematic flow diagrams. A PFD can be computer generated from process simulators (see List of Chemical Process Simulators), CAD packages, or flow chart software using a library of chemical engineering symbols. Rules and symbols are available from standardization organizations such as DIN, ISO or ANSI. Often PFDs are produced on large sheets of paper. PFDs of many commercial processes can be found in the literature, specifically in encyclopedias of chemical technology, although some might be outdated. To find recent ones, patent databases such as those available from the United States Patent and Trademark Office can be useful.